Thank you for contacting us, we aim to reply to your enquiry within the same working day. Required fields are missing. Please check that ALL fields marked with * are properly filled in. You Enquiry is currently being sent. There was an error sending your message. Please check to ensure ALL required fields are filled in and correct then try again. If this persists then please Contact the webmaster. Thank you for requesting a quotation from us. We endeavour to process quotation requests within 24 hours during normal working hours, however, if this is not possible we will contact you as soon as possible. There was an error logging in. Please check your username and password. Success you are now logged in. 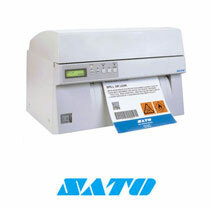 SATO`s new M10e was designed with manufacturing applications in mind. This barcode printer creates labels up to a full 11.8 inches wide at a speed of up to 5 inches per second. © Copyright 2019 ALTech UK Labelling Technologies Ltd. All Rights Reserved. ALTech UK is registered in England and Wales. Registered Number: 6157581.